Fourth Row Center: Film Writings by Jason Bailey: In Theaters: "Robert Jay Lifton: Nazi Doctors"
Robert Jay Lifton would seem an ideal candidate for a documentary; the American psychiatrist and author, a proponent of the techniques of “psychohistory,” wrote a comprehensive study of Nazi doctors, in which interviewed 80 survivors of Auschwitz and 40 perpetrators of crimes there (most of them doctors). We’ll probably never know how good a documentary could have been made from his story, because the film that we have on him, Robert Jay Lifton: Nazi Doctors, isn’t much of a film at all. That is to say, it is one of the most uncinematic efforts you might endure. The technique of amateurish German directors Hannes Karnick and Wolfgang Richter (such as it is) is to point a camera at Lifton and let him talk. Nothing is illustrated—there are no photos from the death camps (aside from a few fleeting stills in the opening credits), no archival footage (even when the material cries out for it, as when Lifton discusses a scene from Triumph of the Will), not even any decent B-roll. When they bother to use transitions between the long interview chunks—and they frequently don’t, creating jarring, wardrobe-swapping jump cuts from one Lifton sound bite to the next—they can’t come up with anything better to show us than the breaking waves near his Cape Cod home. His interview pieces carry on at great length in single, unbroken takes—not even the angles change, as it was clearly a one-camera shoot. There are no cutaways to mask edits that could tighten and punch up his points; when one is necessary, they desperately go to tight close-ups of items in his office, unrelated to his topic. So we’re left spending an inordinate amount of time just watching a man talking, with nothing whatsoever happening visually—it might as well be an audiobook. Does Lifton have interesting things to say? Sure. Enlightening, thoughtful, sometimes terrifying things. But the filmmakers do him no favors by framing and presenting his life’s work in the most unimaginative, dreary fashion possible. The results are, somehow, simultaneously horrifying and dull. I saw the film the day after taking in Nuremberg, another documentary treatment of the horrors of the Third Reich, and was similarly (though less damagingly) bothered by that picture’s disinterest in engaging its audience. The fact that a film is tackling and exploring an important subject does not free it from the obligations and expectations of any documentary: to keep our visual interest, to impart information in a compelling way, to provoke thought. 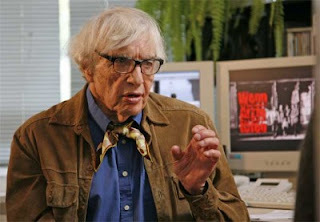 Imagine what a filmmaker like Errol Morris could have done with a figure like Lifton, and you start to see what a missed opportunity Robert Jay Lifton: Nazi Doctors is. "Robert Jay Lifton: Nazi Doctors" opens Wednesday, October 6th in limited release.